Oh my goodness gracious! 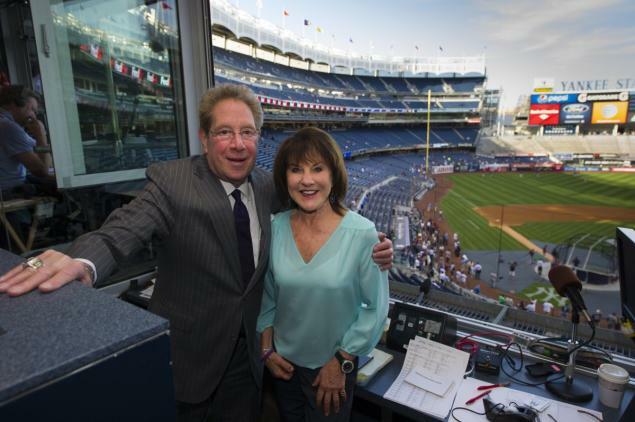 The New York Daily News' Bob Raissman recently reported that John Sterling and Suzyn Waldman will be back in the Yankees' radio broadcast booth for their 12th and 13th seasons together. Raissman says that they have agreed in principle to new two-year deals with WFAN. "Sources said Yankees brass was committed to bringing Ma and Pa [Pinstripe] back," the radio/TV sportswriter reports. Raissman also reported that while negotiations with Waldman went smoothly, things with Sterling were described as "somewhat acrimonious." Shocker! You know, I've said it over and over again: Why does an organization that is allegedly committed to class and excellence keep John and Suzyn in the broadcast booth? Their crosstown rivals Howie Rose and Josh Lewin do a much better job with Mets radio coverage. What's more, you can actually understand what's happening in the game with them. With John and Suzyn, the game sometimes seems incidental to the usual shenanigans and schtick. I can't tell you how many times I've been in the car listening to them, and trying to figure out what is going on with the game, because it's hard to tell from their broadcasts. I shouldn't have to have Squawker Jon use his smartphone to delineate what is going on! Back in the day, when Phil Rizzuto was in his 70s, he did his birthday greetings and schtick, but he wasn't anchoring the broadcasts. He was seasoning for them -- not the full dish. This is not scientific, of course, but most Yankee fans I know are ready for a change behind the radio mike. Not that Hal Steinbrenner would be aware of that. What an out-of-touch owner we have! Not to mention all the incessant advertisements and sponsorships on the radio broadcasts, with everything from the broadcast booth to the fifteenth out having an ad connected. Between that, and all the commercials between innings, it's one big shillfest. Look, I get that WFAN has to pay the bills somehow. And the rights for Yankee broadcasts cost them between $15 and $20 million each year on a 10-year deal. But geez, at some point, shouldn't the quality of the broadcasts count for something? Maybe if the Yankees had taken a little less money, WFAN wouldn't have had to monetize every last bit of the broadcast. If the Yankees aren't going to put on a great product on the field for the next few years, they could at least upgrade the radio broadcast. Also, that is not going to happen. Bummer. The product on the field is improving and will be good enough. But the product in the booth isn't - and, as you point out, it's hardly all John & Suyzn's fault. It is not nearly enough to say, "It could be worse." But, as we've seen, it could be Joe Buck and, well, anybody. At least the color "man" isn't some dipstick who knows nothing about the sport other than that he used to be good at playing it, like Ken Harrelson, Matt Millen, or, God forbid, soccer's intolerable Michael Owen. We had Mel Allen, Red Barber, even Russ Hodges for a while; White and Rizzuto, the Bert and Harry of the 161st Street were ours - they even made it into a DeNiro movie - ("Dream Team"). Isn't it bad enough our three best players are 39 or older and we gave away our second string catcher and kept Austin Romine? No, say the gods of retribution for the Curse of the Babe! ..... We get to keep - have to suffer through - two more years of second grade talent and third class rhyme...whose career high point was "Bowling For Dollars"! We'd be better off with Michael Keaton - the Michael Keaton character from "Dream Team". At least he had an excuse: he was a patient in a Psych Ward!